Today’s sketch is another ‘zombie’ portrait drawn for an awesome backer of the Map of Zombies Kickstarter! The backer requested to be drawn as one of Lovecraft’s ghouls, rather than a zombie, and of course I was more than happy to go with it — particularly since I’d already included Lovecraft’s ghouls on the zombie map buried up in the top right corner under various semi-infectious bestial cannibal things. (I guess it’s very questionable in “Pickman’s Model” whether ghouls are really ‘infectious’ or whether the only people who become ghouls are those who have some preexisting ghoulish blood… but in Robert Barbour Johnson’s excellent semi-Lovecraftian story Far Below the question is settled.) Actually, I would never have thought of including ghouls on the zombie map, except that another ‘zombie encyclopedia’ type of thing (a book, not a map) listed them as “New England Ghouls,” so I figured if they could get away with it, I could. In case I haven’t mentioned it enough, I’m gonna be at Go Play Northwest tonight and this weekend! See you there! Ghouls seem to be a complex infection and yet it may be a symbiosis going on too. Somehow Pickman kept from changing for years. Maybe 300 or so years before finally succumbing. I’d say staying away from the mature ghouls and still eating other humans is probably why. It allowed him to be born sometime in the 17th century. I liked the image in “Pickman’s Model” of ghouls, witches and pirates working as an extended group. Though this picture is of a carnivorous ghoulish satyr. But not a Lovcraftian ghoul at all. And there are ghouls or guls in mythology. 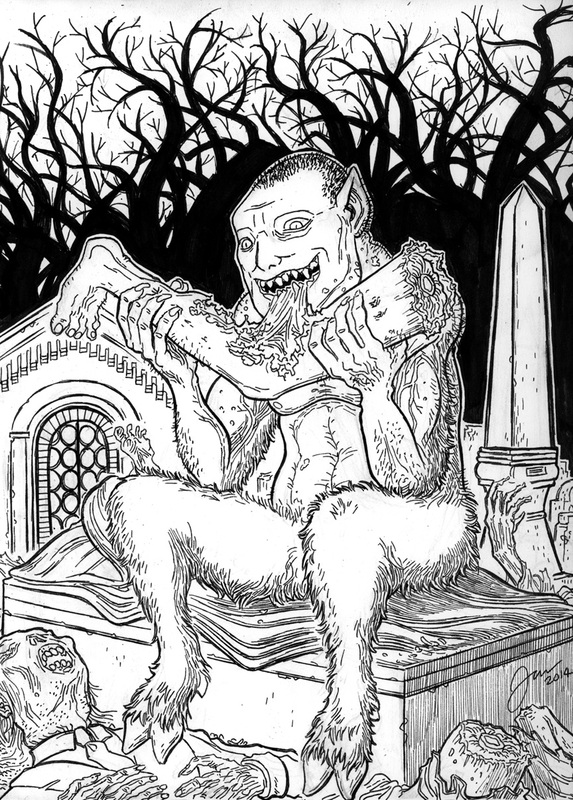 They are found around cemeteries and abandoned places and usually eat the dead. Though they may kill and wait to eat the dead if pressed. Lovecraft‘s are the most distinct of ghouls. I forgot to say that this is an excellent illustration. Maybe satyrs and fauns are human enough to be turned. That would make for an interesting story. Short story anyway. Perhaps the biggest problem of Dream-Quest, visually, is that you have two separate species of hairy-legged naked creatures fighting each other in mass combat. At least they aren’t Donald Ducking it. This portrait is depicting a Ghoul, not a zombie. Then why did you name it A Zombie Portrait? Please be careful with the words as The Creatures of the Night should be distincted.